The 19-million-acre Arctic National Wildlife Refuge is one of the last intact landscapes in America. It's a national and global treasure that's home to polar and brown bears, wolves, muskoxen, and many species of fish and migratory birds. For decades, Big Oil forces have targeted the coastal plain for drilling because it’s not currently protected as wilderness. It’s now more threatened than ever—under a pro-oil administration, the fossil fuel industry will work quickly to exploit the Arctic Refuge and its resources. Drilling and industrial development would likely drive the Porcupine caribou from their calving grounds, endangering the survival of the herd and the Gwich’in way of life. Preserving America’s wild lands is one of the most important legacies we can leave for future generations. Watch Patagonia's new 15-minute documentary "The Refuge” - a story of two Gwich’in women who are continuing the decades-long battle for their people’s survival—and the survival of the wild animals that so faithfully bring them life. Please pledge to protect the coastal plain of the Arctic Refuge from oil drilling and industrial development. 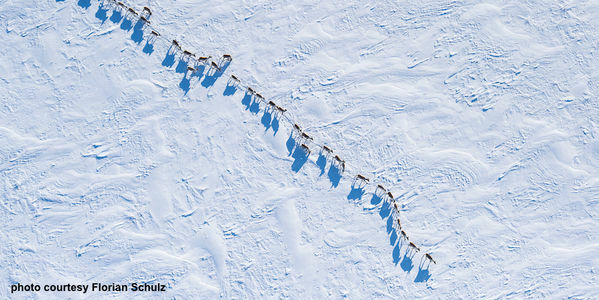 This caribou and polar bear nursery is a global and national treasure worthy of Wilderness protection. The future of one of America’s last wild places is at stake—but by working together, we can help ensure the survival of the people and wildlife that call the refuge home. Thank you for your conservation leadership and commitment to defending our country’s land, water and wildlife.